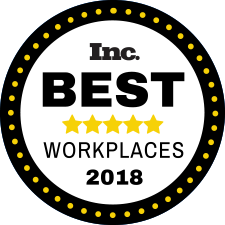 Chattanooga, Tenn., May 24, 2018 – Reliance Partners has been named on Inc. magazine’s Best Workplaces in 2018, the magazine’s annual ranking in the fast-growing private company sector. The 2018 Inc. Best Workplaces Awards assessed applicants on the basis of benefits offered and employees’ responses. Survey scores account for employer size to level the playing field between small and large businesses. All companies had to have minimum of 10 employees and to be U.S.-based, privately held, and independent – that is, not subsidiaries or divisions of other companies.